Here you go @caranita an @mei2018, video of Arthur baking a chocolate cake. Is there anything Arthur can't do? I think he cant dance! The kitchen utensils looked nice .. Thank you! I cannot bake the cake. He looks very comfortable and confident doing it. Not sure about Leon Lai and Dylan Kuo, but Adam Cheng is definitely not coming back in EN2. (This has been discussed on EN forum here). They didn't say anything in their respective weibos? Don't bother with the DW-SY shippers! 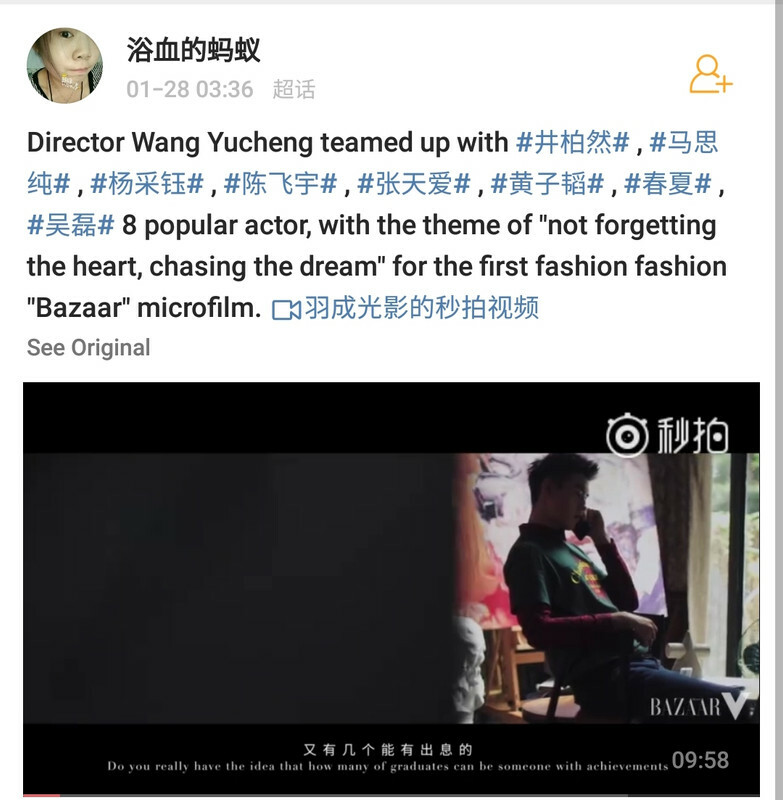 I saw that Dylan Kuo was listed in EN2 cast but Leon Lai was not. So.. may be he will not reprise his role. Some GIFs i think he also cant act cute seamlessly . Credit as tagged. Short Baazar movie. Credit as tagged. Some old pics. Credit as tagged. Thank you @epinklyn! I've seen the short movie before, but didn't realize Arthur took part in it! Instead at that time I only focused on Jing Boran and Ma Sichun, both of which are my favorite actors. Arthur is dapper and looks a lot more mature! I've seen his pictures in black tie, so I supposed that was also part of this Vogue project? He's effortlessly cool, charming and suave! Now, he needs to work on standing still to look more confident (he tends to move his body a lot) and speak just tad bit louder. He can learn from his brother, who seems to be a more experienced public speaker. @caranita, do you mean the pic in black suit, the one he wore in Dior Fashion Week? Dont know about Vogue, i havent researched until that far LOL. Yes he tends to move his body a lot, doing this doing that, and that spesific motion i have mentioned, i also think he was nervous, but he also did it in the Ever Night, so i dont know why hmmm... One day if i lucky enough to meet him in person, i will ask about this LOL. CFY's Chinese New Year Greeting in A-List Fashion Interview. Credit as tagged. Pics of CFY going back for Chinese New Year. Credit as tagged. Have you listened to this song yet? This is my first tome listen to CFY sang a song. Dont know when this video was made, but he was really skinny, so i think in between year of 2016-2017? When he was filming Secret Fruit or after. Credit as tagged. Yes i have, in fact it was in my fav playlist together with Ever Night OST in Spotify and my own playlist in my car . There are two more songs with him singing, but his part not as many as 秘密 (Secret) song, but his voice is stand out on those songs. I really like his talking voice especially when he narrate something, or tell a story, so crystal clear and soft but manly, hmmm cant find the exact word...but his singing voice also surprisingly good, his singing live performance also good. I think because he can play music (guitar) so he understand tones and melody. Here are two other songs. Credit to Nana OuYang Fans Club on Youtube. BTS video of CFY as Duan BoWen. Credit to My Sunshine：陳飛宇台灣首站 . Some videos, credit as tagged. My bad, I should've said "tuxedo" instead of "black tie", but they mean the same. I'm pretty sure I saw some pictures of him wearing tuxedo, and boy, does he look dashing! I assume he was wearing them for the Vogue mini movie, but I could be very wrong.